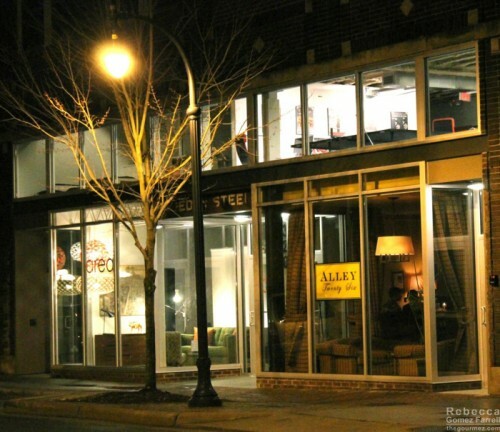 320 East Chapel Hill St.
To my disappointment, Alley 26, Durham’s newest upscale bar, is not located in an alley. It takes up actual streetfront property, though I’m sure the alley beside it will be used in nicer weather than we had when I tried it in February. 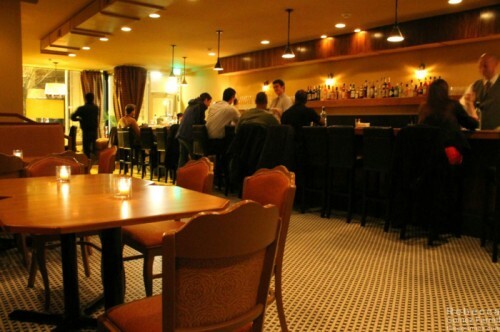 I was pleasantly surprised to find the bar had more than a handful of patrons at 8 pm, mostly young professionals. That’s a good sign for me because I like mid-evening drinking but I hate feeling like the only person in a joint. The bartenders dress in today’s snazzy bar wear, namely nice vests over black pants and button-up shirts. Jazz plays over the stereo system, but none of that elevator music. Instead, a beautiful jazz lyricist sang loud and clear on the recordings. The vibe is somewhere between an antique saloon and a speakeasy with tables built of medium-colored wood and a row of benches covered by peach cushions that aren’t very comfortable but are somehow perfect because they make you feel like you’re at your cool, alcoholic great-aunt’s house. You know, Aunt Maude’s place. 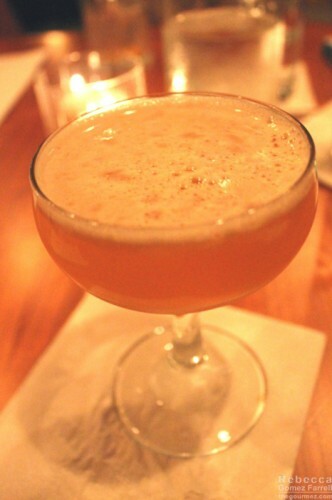 The Corpse Reviver No. 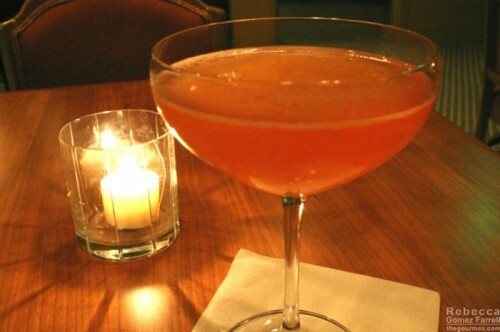 Twenty Six, the bar’s take on the standard concoction, is made with a North Carolinian apple brandy, Lillet rosé, Aperol, lemon, and a brut rosé. It’s a distinctly fruity corpse reviver with a gorgeous color. The citrus elements of the drink are delightful, and the mild bitterness of the Aperol counteracts the nearly peach flavor of the brandy. With light fizz tickling my tongue, I found it an exquisite, vibrant drink. My friend had the Mediterranean Homesick Blues made with cardamom, gin, rose water, and I believe, Prosecco. 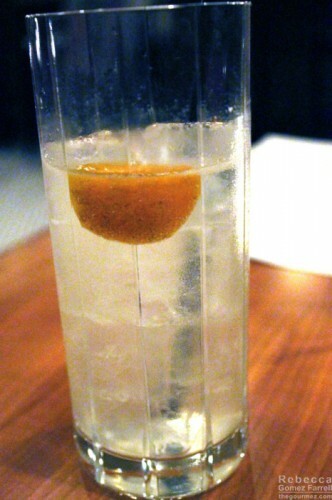 The drink had many layers but managed to come across as light and refreshing. By the time we considered our second drinks, a pair of surprise ones hit the table! That’s the privilege of (a) a good bartender, (b) being with a friend who knows said bartender, and (c) being a conspicuous taker of lowlight cocktail photographs. One of Alley 26’s bartenders, Shannon Healy Dean James, who mainly works at Peccadillo and Crook’s Corner in Carrboro (3/18, thanks for the corrections, Dean! Shannon owns Alley 26, but I did not meet him), mixed us drinks he guessed we would like based on our first choices. One was a Jack Rose variation, using the apple brandy, lemon, and grenadine. It made me think of cinnamon although it contained none. Perhaps the apple simply conjured up notes of cinnamon in my brain? Stranger things have happened. In fact, it happens all the time when tasting wine, being as grape and wood are never my only notes. 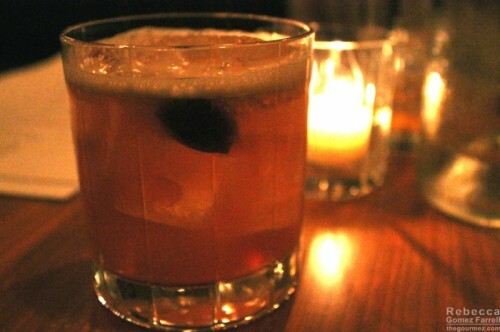 The second surprise drink was a take on a Gold Rush, a bourbon, lemon, and honey cocktail. After being assured we were happy with our second round, Shannon Dean joined us, and who doesn’t like a bartender who’ll share a drink with you to cap off the evening? Alley 26 has a new fan in me, and I may end up part of that handful of 8 pm regular imbibers. They do offer some nibbles as well, what I would call a standard wine bar menu of olives, charcuterie, cheese plates, and the like with a focus on locally procured ingredients. Perhaps I’ll try one of those next time. Because there will be a next time.